Gray hair can be beautiful and dramatic. Sometimes it's just best to go back to nature. You’ve dyed your gray hair back to its original brown shade for a while, but the grays seem to be popping out faster and faster, and the time and expense of coloring have become a bother. Dyed hair that is too dark can be more aging than gray can be, and a mane of white, silver, pewter or salt-and-pepper hair can be elegant and stunning on women of any age. Once you’ve decided to ditch the dye jobs, you can choose whether to do it yourself or consult a professional. Let it grow. Depending on how dark your hair is, you can let the gray grow out a 1/2 to 1 inch before taking action. Use root touchup in stick or powder form to blur the gray into the brown. Highlight it. Highlights or frosting will add a few lighter strands to blend the dyed hair with the new, lighter gray and help blur the lines of demarcation. Buy a highlighter or frosting kit at the supermarket or drugstore. Follow the kit’s instructions for mixing, applying and timing. Apply the highlights or frosting from the gray roots down through the dyed-brown areas to provide dimension and help create a gradual change to gray. Condition it. 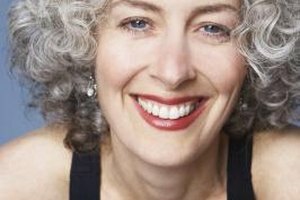 Gray hair has a different texture than natural or dyed hair has. It is often dry, coarse, brittle or fragile, so look for special shampoo and conditioner products for dry or breaking hair. 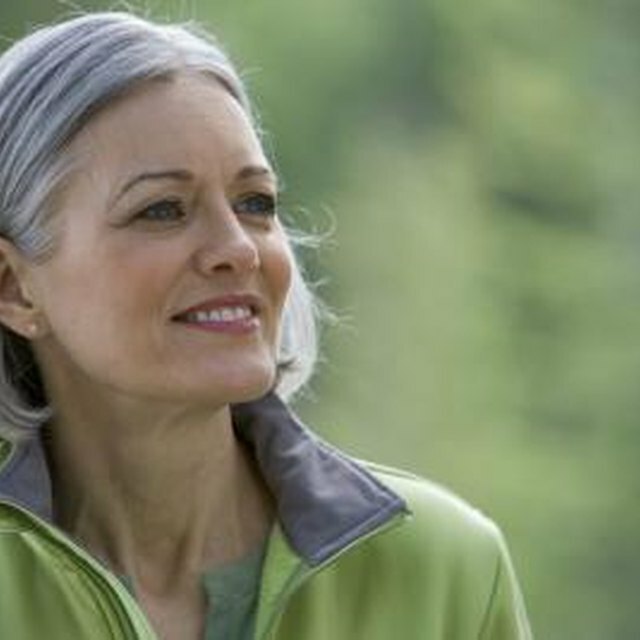 Try products that contain tints designed to ward off yellowing of gray hair. Go easy on the tints, though; don't become the blue-haired lady. Get help from your colorist. If you’ve been having your hair professionally colored and styled, changing to gray may simply mean waiting longer between visits to your salon. Your colorist may be the one to help you through the transition period by applying highlights or frosting. Get a cut. Your stylist can find a flattering style to ease you through the transition. She may recommend a short cut and frequent trims to get rid of the old dyed locks. Becoming gray doesn't mean becoming frumpy; fashionable styles look just as chic in silver. Take it easy. Avoid styles that require too much reliance on styling tools and products; gray hair must be treated gently. Once the dyed hair has gone, let your hair grow as long as you wish. Adjust your makeup to go with your new hair color. Lighter shades of foundation and lipstick combined with softer eye makeup may be more flattering than your usual shades. How Can I Turn My Gray Hair Into Highlights? How Can I Keep My Newly Highlighted Hair From Falling Out?